Back of the Head: Smallville: Season 11 #7 - "Guardian"
SUPERMAN! LOIS LANE! LEX LUTHOR! CHLOE SULLIVAN-QUEEN! THE GREEN ARROW! DR. EMIL HAMILTON! COMMANDER HANK HENSHAW! In Smallville, the crack husband and wife investigating team of Queen and Sullivan-Queen (as labeled in the caption) are tracking the mysterious space craft that landed in the cornfield. It's night time and it's dark out there with the corn so Green Arrow shoots a flare arrow into the sky. 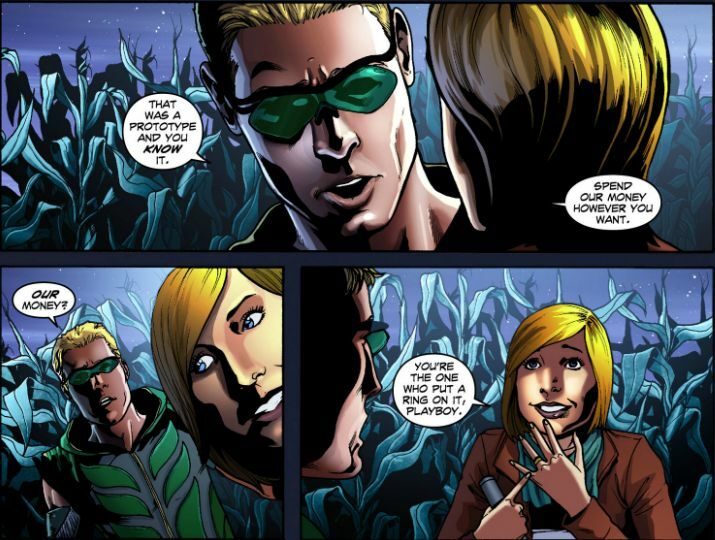 Chloe takes the opportunity to have some fun with her touchy, defensive husband and mocks his no doubt intensive R&D into developing a boxing glove arrow. Meanwhile, at STAR Labs, Dr. Emil Hamilton receives a visitor he can't and would never refuse in the form of pushy but super attractive girl reporter Lois Lane. Lois is checking up on Commander Hank Henshaw and his prognosis (or is it diagnosis? Whichever.) is not good: He has suffered severe burns, loss of motor function and he's in a coma. His mind functions but he's trapped in his own body. Like Commander Pike on Star Trek. Emil should build him a special wheelchair with a blinking light - blink one for yes, two for double yes (copyright Zapp Brannigan). Henshaw's distraught wife, let's call her Mrs. Henshaw, blames Superman. Like, completely blames Superman. Why wasn't Superman fast enough to save her husband when he pushed a whole planet out of the way? Good thing Clark didn't hear this or else he'd be really bummed out. Lois tries to come to Superman's defense, but there's no consoling Mrs. Henshaw, who demands to know what Superman's "going to do about it?" I'll tell you what he's going to do: He's going to pick a fight with Lex Luthor, that's what. In the Lexcorp building, where Lex Luthor has for some reason built an elevator that makes the onomatopoeia "DOOM!" sound when it opens, Lex fixes himself a drink when Superman comes knocking on his window. Then he smashes it and all of the glass around, including the glass in Lex's hand, with a mighty Super clap. * When Superman is feeling polite, he'll ask you to step outside. Not now -- Superman is pissed. Superman accuses Lex of activating the Guardian platform in mid-flight. Lex, a very wealthy man, owns a river in Egypt called Denial (I apologize). Clark - I mean, Superman - starts yelling at Lex with balled fists and looks like he's gonna slug him. But Lex calmly stands his ground as three attack helicopters from General Lane and the US Military order Superman to stand down. That line, "Never seen a stranger get that mad, that fast", is most intriguing. Either Lex does remember or his super intelligent mind is processing things so quickly, he's on the cusp of remembering everything, like how he used to love hugging Superman when he was a teenage boy. Lex plays his hand: Superman was present when the Russian space station exploded. Superman was there when Guardian exploded. Now Superman is at Lexcorp looking to smack around its CEO. It doesn't take Commissioner Gordon holding a Batarang** in a baggie to point out this evidence is purely circumstantial, but Clark isn't thinking straight. The US Military orders Superman to turn himself in for questioning. Superman refuses. Lex: "I think this is the part where you run." * Strangely, my digital copy of this issue had these pages in reverse. In my issue, Superman claps and smashes the glass, then in the next page he knocks on Lex's window. It was very confusing. 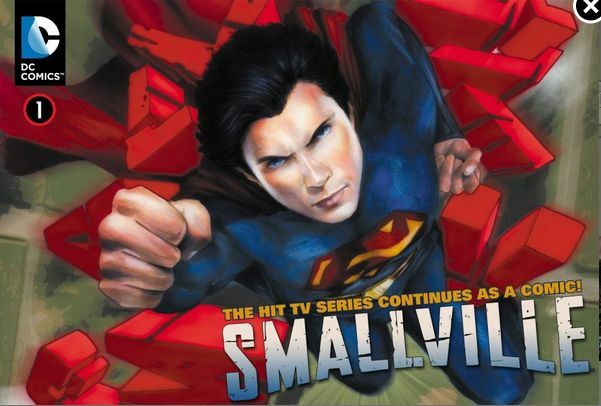 ** This is my clever way of shouting out the big news about the Big Guest Star coming soon to Smallville.